There are certain things Scots miss intensely when away from Scotland at Christmas – family, friends, a peat fire and food. Especially traditional Scottish food and drink. It’s not surprising really when you think there is an estimated 50 million people around the globe with an affinity to Scotland. They are bound to miss the comforts of home. Popular dramas, like Outlanders, have also succeeded in reminding everyone that Scottish foods are far tastier than deep fried haggis. Our family run business has over ten years’ experience championing traditional and modern Scottish brands and sending them within beautifully presented gift hampers to UK, Europe and worldwide. In our experience here are the Scottish food and drink most wanted as a gift this Christmas. To the inexperienced, the Tunnock’s teacake might just look like a dome of marshmallow covered with milk chocolate, but to the traditionalist, this sweet treat, wrapped in its iconic shiny foil, is a national treasure. The mere mention of Tunnocks sends Scots back to their childhoods. Tunnocks lovers will really enjoy our Sweet Toothed Gift Selection, as well as our Taste of Scotland hamper and Luxury Christmas Hamper. You can also create your own hamper selection with your favourite Scottish food and drink. Once rumoured to be flavoured by Falkirk’s iron girders, this bright orange pop has an extra special place in Scottish hearts. When MacDonald’s opened in Scotland, local Scots picketed the restaurants until the American giant agreed to sell their favourite ginger. Today you’ll find it much easier to buy Irn Bru online here . 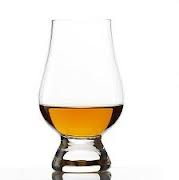 Whether it is a wee dram for Santa on Christmas Eve or to toast family and friends on Christmas Day, whisky is an essential ingredient to a Scottish Christmas. For the whisky connoisseur, the Malt Whisky Lover’s gift hamper is a great Christmas Gift. Or you might prefer the Savoury, Whisky and Cheese Gift Box. Alternatively, we stock a variety of whisky flavoured treats including haggis, honey and marmalade. Add these to a gift box or wicker basket to create your own unique hamper selection. A slice of deliciously light clootie dumpling will transport many back to the days when their granny steamed dumpling over the fire. The whole house would have been filled with a lemony orange fug. Award-winning Tilquihillie clootie dumpling features in our impressive Inverness Hamper which is a perfect Christmas gift for large groups and extended families. 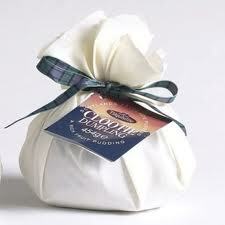 Remember you can create your own Scottish Christmas hamper selection too. Shortbread is a biscuit ‘shortened’ with glorious butter. It is crisp and snappable- hence ‘short’. History suggests Scottish bakers used the name “shortbread” to escape the government’s tax on biscuits. Whether true or not, this “bread” is great with a cuppa or dram of single malt whisky. Shortbread features in many of our Christmas Hampers, as well as our Sweet Toothed Gift Selection. While perhaps not as well known outside Scotland as whisky, Scottish ales and Orkney Beers have a sophisticated taste all of their own. Each sip is a gentle reminder of the landscapes in which they were crafted. New for 2014, our Beer and Savoury Gift Hamper is a fine selection of beautifully crafted beers. 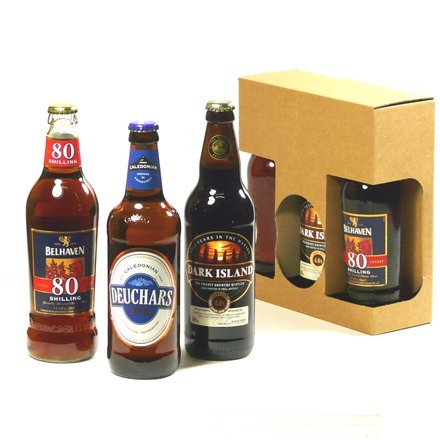 You might also like to add some Scottish ales when you create your own Christmas hamper. We couldn’t finish this list without mentioning haggis. Despite its unfair reputation overseas, it is still the food most missed by Scots and not just for Burns Night. There is simply nothing like its oaty, earthy flavours. It is worth noting though that we can’t deliver fresh haggis and other perishable foods outside the European Union (EU). If you would like haggis delivered outside the EU, please visit our sister site, Haggis UK. Scottish food and hampers really do make great Christmas hampers for your favourite Scots living in the UK, Europe and further away overseas. We hand pack every hamper to order so we can fill it with all your favourites. Add a personal message and within minutes you’ve created a really thoughtful and tasty Christmas gift. Perishable food can be delivered within the European Union. Outside of the EU any selected perishable items will be substituted for other items to the same value or higher. All fresh food must be sent express delivery (EU only) due to its perishable nature. Do you and your family have any foodie Christmas traditions? We’d love to hear them.